Military families make extraordinary sacrifices, and it is difficult for civilian families to truly understand the hardships they endure. While there is no way to truly repay them for their service, there are some rewards that can help to ease their burdens. Scholarships are one way of giving back to the families of military service members, and to provide much needed financial assistance for the spouses and children of service-men and women as they pursue a college education. Scholarships for military spouses take a variety of different forms, and are supported by the various branches of the military, as well as Federal and state governments. Some scholarships target the wives and husbands of currently serving military personnel. Others are dedicated to the spouses of service members who have been killed or disabled in service to their country. The wide range of scholarships for military spouses are designed to help military family members pursue their college education. It is a small way of giving back to the military community, and it helps thousands of men and women every year to achieve their college ambitions. Scholarships for military spouses are supported by a variety of sources. Each branch of the United States military offers some level of financial aid for its service members and their families. Many state governments, as well as many civic groups interested in the welfare of military families, also provide ample scholarship opportunities for veterans and their spouses. Scholarship programs for military spouses, regardless of sponsor, all have one thing in common : they are designed to recognize and reward the great sacrifices made by service-members and their families. The most substantial source of scholarships for military spouses are the armed forces themselves. Each branch of the military provides a variety of financial aid programs to support the educational goals of enlisted personnel and their families. 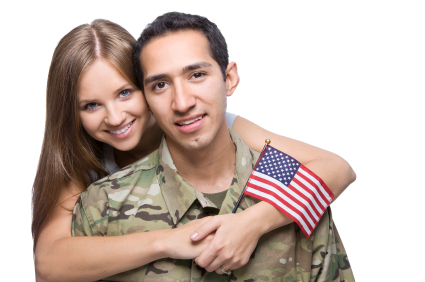 The following examples of scholarships for military spouses are directly supported by the United States military. The U.S. Army sponsors the Spouse Education Assistance Program. This need-based scholarship provides financial assistance to the spouses of Army soldiers who are pursuing an undergraduate degree. To be eligible, applicants must be the spouse of either a soldier on active duty, a retired soldier, or of a soldier who died while in service. Applicants must be enrolled in an accredited college or university, and must maintain a 2.0 GPA. The scholarship is renewable for up to four years. The U.S. Navy-Marine Corps Relief Society sponsors the Gold Star Scholarship Program for the dependent children and spouses of Navy and Marine personnel who were killed in the line of duty. Awards are determined by a combination of financial need and academic merit, and range from $500 to $2500 per academic year. The Joseph A. McAlinden Divers Scholarship is available to the dependent spouses of active duty Navy divers. Applicants must be enrolled in an accredited oceanography program at a participating college or university. Awards are determined by financial need and academic merit, and range from $500 to $3000. The Coast Guard Foundation supports the USAA Enlisted Coast Guard Reservist Family Scholarshipfor the families of enlisted and reservist Coast Guard personnel. Six $1000 scholarships are awarded annually to the dependent children and spouses of eligible Coast Guard personnel. Every state in the country has a dedicated Department of Higher Education, through which the state administers a variety of financial aid programs for its resident students. Many states also have a Department of Veteran’s Affairs, which provide financial assistance to military personnel and their families. These programs will vary widely from state to state, and students are encouraged to research the programs that may be available within their state. The following examples should highlight the types of scholarships for military spouses that are available at the state level. The Alabama Department Veteran’s Affairs supports the G. I. Dependents’ Scholarship Program for the spouses and children of military veterans. To be eligible, applicants must be Alabama residents, and must be the spouse or child of an honorably discharged veteran, or of a veteran who was disabled or killed in the service of their country. Connecticut sponsors their Veteran’s Tuition Waiver for the surviving spouses of military service personnel who were killed in the line of duty after September 11, 2001. While not strictly a scholarship, this program provides much needed financial assistance to military widows and widowers who are struggling to complete their college education following the death of their spouse. Students must apply through the financial aid offices of their college of attendance, or through Connecticut’s Department of Veteran’s Affairs. The Maryland Higher Education Commission sponsors the Veterans of the Afghanistan and Iraq Conflict Scholarship. This program offers scholarships to Afghanistan and Iraq veterans, their dependent children and spouses, who are enrolled in degree-seeking undergraduate programs at a Maryland state college or university. Maximum scholarship awards may not exceed 50% of the applicant’s full tuition costs. Many charitable groups exist around the country to support the needs, both financial and emotional, of military families. A large number of these groups support scholarships for the children and spouses of active duty military personnel, veterans and POW/MIA’s. While many of these programs may not offer the same level of financial assistance as their state supported and military supported counterparts, they do provide valuable assistance to military spouses struggling to pay for college. The few examples that follow illustrate the types of scholarship programs offered by charitable foundations and civic groups around the country. Interested students can find further information on scholarship programs for military spouses by contacting local military family support groups. The National Military Family Association is dedicated to supporting the needs of military families across the country. The NMFA administers the Joanne Holbrook Patton Military Spouse Scholarship which is designed to prepare military spouses for meaningful employment. Scholarships may be used for vocational training, professional certification, undergraduate and graduate school. ThanksUSA is a charitable foundation dedicated to helping military families achieve their educational goals. The ThanksUSA Scholarship provides up to $3000 in funds to eligible spouses of active duty, and reservist, military personnel. Applicants must be enrolled in an accredited college or university to be considered eligible for any award. Salute to Spouses is a national support group looking after the needs of military spouses and their children. In addition to providing counseling and career advice, Salute to Spouses administers a variety of scholarships for military dependents, including the Folds of Honor Scholarship and the Hope for the Warriors Scholarship for the spouses of military personnel who have been disabled in the service of their country. These scholarships put an emphasis on vocational training, and post-secondary education programs that are designed to give military spouses the education they need to advance in the national workforce. Military service-members and their families occupy a unique position in the American population. They sacrifice much to defend the ideals of our nation, and one of our most precious ideals is the right to a higher education. Scholarships for military spouses provide more than just financial assistance, they provide a validation of the great sacrifices military families make on behalf of all of the citizens of the United States.